Beijing during rush hour. Now imagine an extra 30 million cars a year. Auto sales in China are soaring. Just how high is up? Here's one eye-popping estimate: 30 million vehicles a year. Last year, China's sales, including trucks and buses, surged 45 percent to nearly 14 million, and the country surpassed the United States as the world's biggest auto market. In the first quarter of this year, sales jumped 72 percent. 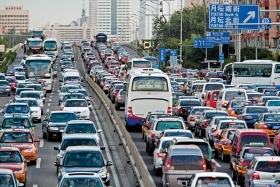 Xu Changming, director of the information resource department of the government's State Information Center, predicts that, at some unnamed -- although, he implied, not too far off -- date, China's annual market for cars, trucks and buses would reach 30 million. That's more than the United States and Europe combined last year -- and, in fact, would be more than the United States and Europe in a pretty good year. Speaking at a conference at the recent Beijing auto show, Changming also said the total number of cars, trucks and buses on China's roads eventually could climb to 450 million. Today's global vehicle total is 900 million. Analysts expect China's sales pace this year to taper off. Most still see full-year growth at 15 to 20 percent. But if volume grew for three years straight at last year's 45 percent rate, China would be at the doorstep of 30 million units in just three years.